All homes have quirks that require special care and consideration, but when it comes to homes with basements, it’s a whole different ball game. Instead of fighting with the lightswitch on the north wall, you’re trying to keep the carpet dry and catch any water long before it becomes a problem. Waterproofing the basement can be useful if water is seeping in, but there are also plenty of easy DIY friendly things you can do around the house to keep more water out of your basement. Your basement is more than just a cement-lined hole in the ground, it’s a part of your home like your kitchen or your bedroom. Unlike those rooms, many basements can develop problems with water, either coming in from outside or coming down from the floor above. Water in a basement can result in higher humidity levels, musty odors and the rapid growth of mold colonies. Your basement isn’t meant to be a swimming pool. It’s high time you found out where your water is coming from so you can cure it for good. Even a little bit of water seeping into your basement on the regular is cause for concern. Besides the mold and foul smells mentioned above, that water helps encourage pests that need moist environments, like, say, cockroaches. Check the grading around your house. As water flows around a home’s foundation year after year, it’s reasonable to expect that some erosion will occur. A little bit is not a big deal, but that little bit usually turns into a lot as time goes by. Eventually, you may even end up with a negative grade, essentially a grade in your yard that diverts water to your house rather than away from it. It’s not difficult to regrade the land around your house, though it can mean a lot of labor. Check out Today’s Homeowner’s tutorial to get started! Ensure that all gutters and downspouts are in working order. Water that spills over the sides of your gutters is water that can go anywhere it pleases. That’s why clean gutters are so important to keeping water out of your basement. Clean those gutters at least twice a year (and be extra thorough right after the last leaves have fallen) and check that all your joints are fitting well. Water from the garden hose can help you figure out where problems exist, if any. Other add-ons like splash blocks and downspout extensions further redirect water once it’s on the ground. Maintain basement window wells. Not every basement house will have window wells. But if yours does and they’ve been neglected a good long while, they could be contributing to your water issue. Clean them out, lay down some fresh gravel and put new window well caps on to drive water away from your basement windows. You may end up needing an expert to help, depending on how much damage water and wet leaves sitting against the window frames has caused. Check the plumbing. It may be unpleasant to consider, but if that water isn’t coming from outside, then it has to be coming from inside. Leaky toilets and shower drains are always suspect, but any part of the plumbing system could have a small persistent leak. If you can find it, you can fix it and stop any potential damage that could be happening overhead, too. Examine your furnace air handler. When your run your air conditioner, room air is pulled into your furnace or air handler, run across something called an a-coil (due to its shape) and pushed back out much colder than when it started. In the brief moments that the room air is above the a-coil, it drops a significant amount of water into a pan below as it rapidly changes temperature. From there, the water goes away through a condensation line. This is what happens in a perfect world. In a world where people don’t’ always maintain their air handlers like they should, the condensation line can get plugged up, causing the pan in the furnace to overflow onto the floor. If this looks to be the case, it’s often a fairly easy fix. With the HVAC system turned off, remove as much water as you can from the condensation pan, then fill the condensation line with vinegar. Let it sit until it’s freely draining once again. 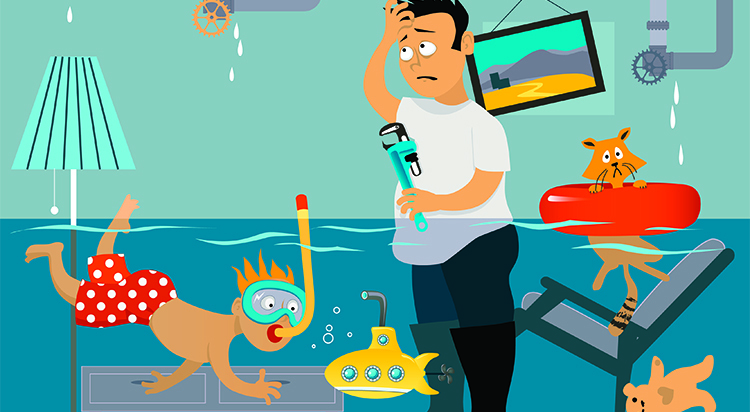 These tips should help solve your basement water problem, but if it continues to reoccur, waterproofing or installing a sump pump (or both!) may be warranted. Generally, if your water issue is more than a small puddle, it’s better to just to go ahead and call in a pro rather than to continue to beat your head against the problem. Where Can You Find the Best Basement Pros Around? They’re members of the HomeKeepr community! Just log in, ask your HomeKeepr family for some recommendations and you’re already well on your way to a dry basement you’ll love to spend time in. Since other pros are staking their reputations on the referrals they’re giving, you know the expert you hire will be the best!